Breathe Healthy has donated $1000 of children’s sized respiratory protective masks to the Children’s Hospital of The King’s Daughters (CHKD) in Norfolk. See the whole story. Breathe Healthy expands their face mask production capability by teaming up with IOI. See the press release on PRLog. Breathe Healthy’s new product, The Travel Halo, addresses the need for a better, more effective travel pillow. The Travel Halo was featured in Travelin’ Tales. Breathe Healthy Announces New Travel Product – The Travel Halo™. Breathe Healthy Masks make the news again! Breathe Healthy attended PetQuest 2010 in Ft Mitchell, KY. Although our masks have many uses, they have really found a home with pet groomers who are trying to protect themselves while shaving / blow drying / grinding nails of our furry friends. One notable grooomer we met at the show was Ellen Ehrlich. She is a big proponent of safe grooming and using our masks. She has a great website, http://www.royalcaninemobilegrooming.com/, where you can also puchase a copy of the book she has written about mobile grooming. Breathe Healthy is accepted into the James City County Business and Technology Incubator. Breathe Healthy will be attending the National Dog Groomers Association of America’s new “Colorado Groomfest“. The 2010 Colorado Groomfest will include an NDGAA Seminar, Competition, and Trade Show on June 4, 5, and 6th. We hope to meet some of our current customers there while also making a few new ones. 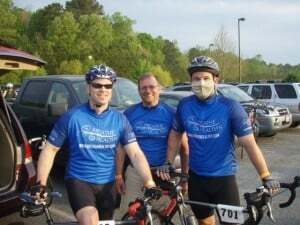 Chesapeake, VA – April 17, 2010 – Breathe Healthy, a manufacturer of breathing masks for respiratory health, formed a cycling team to participate in the American Diabetes Association’s 100 mile Tour de Cure fundraising ride. As if pedaling 100 miles wasn’t enough, one of the team members did it while wearing a breathing mask. The small cycling team was arranged this spring. “Team Breathe Healthy” consists of the owner, his brother-in-law, and a few close friends who enjoy cycling. “I wanted to donate a portion of our profits to a noble cause, but had trouble choosing the right cause and the right way to give. By forming a cycling team, we can support a variety of charities, while also doing what we love to do. It’s a great way to give back, promote our products, and get in shape at the same time,” said Mike. The team raised over $600 for the Tour de Cure. The American Diabetes Association is the nation’s leading non-profit health organization supporting diabetes research, information, and advocacy. Their mission is to prevent and cure diabetes and to improve the lives of all people affected by diabetes. The Tour de Cure is one of their largest fundraisers, and stages cycling events around the country. When asked about wearing the mask for 100 miles, Mike said, “I receive questions regularly from customers who are runners or cyclists, and want to know if they can run or cycle while wearing our masks. Other than feedback from other users, I couldn’t really tell them how our masks performed. After riding a bicycle 100 miles with the Breathe Healthy mask, I can say that I didn’t even notice the mask – but my legs were certainly a concern! The air has been thick with pollen this spring, so it really helped with my allergies during the race as well.” According to Mike, Breathe Healthy is beginning to market its masks towards athletes and active individuals who don’t want their allergies, immune deficiencies, or respiratory issues to affect their active lifestyles. Learn more about Breathe Healthy and their products at www.breathehealthy.com. As the world approaches another Swine Flu wave and we see natural disasters like the earthquake in Haiti and volcanic eruptions in the Philippines and Indonesia, we are reminded how important respiratory protection is for millions. According to a recent study published in Emerging Infectious Diseases, the journal of the Centers for Disease Control and Prevention (CDC), you can cut your risk of contracting the flu or other respiratory viruses by as much as 80 percent by wearing a mask over your nose and mouth. The lead author of the study, Raina MacIntyre, an epidemiologist and head of the School of Public Health and Community Medicine at the University of New South Wales in Sydney, Australia, confirmed that this was the first clinical trial to show a positive effect of masks on preventing the transmission of respiratory viruses. Another study by the University of Michigan, School of Public Health says wearing masks and using alcohol-based hand sanitizers may prevent the spread of flu symptoms by as much as 50%. Amazingly, these studies represent the first, real examinations of the effectiveness of non-pharmaceutical interventions in controlling the spread of the flu virus in a community. You and I might think, “Well, duh, wash your hands and wear a mask.” But you might be surprised by how many people don’t get it – at least the mask part. Some cultures like Japan and China are quite accustomed to wearing masks in crowded areas, as an everyday precaution from contracting flu symptoms, colds and germs. However, it isn’t part of the American culture to wear these breathing masks in public. As a culture, we will need to “get over” this very soon because there are just too many risks out there. In October, the Swine Flu took a deadly turn in the Ukraine as a deadly mutation appeared that sickened hundreds of thousands and killed hundreds in a few weeks. The strain then spread to other countries in Europe, as well as the U.S. The reality is, when the Flu hits our communities again, or a natural disaster strikes, for us to maintain a normal life and visit crowded places like grocery stores, schools, shopping malls and airports, we will need to incorporate frequent hand washing and breathing masks into our everyday lives. The CDC states that one of the primary means of flu contamination occurs from droplets that are generated when infected persons cough or sneeze and secondly by contamination of the things we touch. One of the primary purposes of any mask is to defend against airborne effluents, and all types of masks offer various degrees of effectiveness. There are advantages and disadvantages to each. Now let’s examine the different kinds of masks out there and find the best option for you and your family. A facemask, commonly known as a surgical or hospital mask, is a loose-fitting, disposable device that creates a physical barrier between the mouth and nose of the wearer and potential contaminants in the immediate environment. If worn properly, a facemask is meant to help block large-particle droplets, splashes, sprays or splatter that may contain germs (viruses and bacteria) from reaching your mouth and nose. Facemasks may also help reduce exposure of your saliva and respiratory secretions to others. Also, keep in mind. These facemasks are not intended to be used more than once. They are made of paper which is easy to mass produce offering a very basic level of protection. Remember that hospitals use these masks for a reason, which doesn’t necessarily make them the right choice for the rest of us. Hospitals require a disposable mask because doctors and nurses go from patient to patient and they need something new and fresh in each room. Otherwise, they may introduce sickness from one patient to the next. The disposable, hospital/surgical facemasks are widely used by hospitals because they serve a purpose and fit into a budget. These mass-produced masks offer a relatively basic level of protection but seem to be popular because they are easy to find and are very cheap. There are however, many drawbacks to this low-cost, disposable option. Generally, these are relatively low quality masks because they are mass-produced. They provide the lowest relative level of respiratory protection and they are only good for one use. This of course, makes them wasteful and bad for the environment. Their advantage is that they are easy to find and very affordable, at an average cost of less than one dollar per mask. However, when breathing protection is needed many dozens of times over the course of a few months you can see how the cost can quickly add up. For instance, let’s say the Swine Flu rears its ugly head again in your community next month. You will likely want a mask if you go to school or have kids that go to school, while shopping at the mall, the grocery store, or visiting sick relatives. Also, if you live in an earthquake zone, near a volcano, or if wild fires are a concern, you will need to have dozens and dozens of masks on hand in case a natural disaster hits. And then what if you run out of these paper masks and can’t find them anywhere because they are sold out. This was a real concern last year in Japan as people scrambled to protect themselves from the Swine Flu Pandemic. Overall, paper masks are fine for hospitals, but are not the best option for cost-effective, optimal respiratory protection which can be needed over long periods of time. An N95 respirator is a respiratory protective device designed to achieve a very close facial fit and very efficient filtration of airborne particles. These masks are made of a paper/fabric combination and are rated N95 by the NIOSH division of the Centers for Disease Control. The ‘N95’ designation means that when subjected to careful testing and if properly fitted, the respirator blocks at least 95% of very small test particles. N95 masks are recommended by various health authorities for added defense against the transmission of viruses. However, to work as expected, an N95 respirator requires a proper fit to your face. Where respirators are used in a non-occupational setting, fit testing, medical evaluation and training are recommended for optimal effectiveness. The best known N95 masks are the pre-formed, respirator type worn primarily in industrial settings. Some Retailers claim this type of mask offers total protection, however even the most respected, reputable manufacturer of this type mask will not state that their masks guarantee protection. Further, they note that in order for this type of mask to perform effectively, it is essential that the mask fit tightly. However, while these masks are made to fit a majority of faces, one size does not fit all. Obviously, the masks you purchase “over the counter” at hardware and home stores are sealed and generally they cannot be “fitted,” and I can find no consumer retailer that offers this service. A major drawback for the “rest of us” is that N95 respirators are not designed for children or people with facial hair. Because a proper fit cannot be achieved on children and people with facial hair, the N95 respirator may not provide full protection. Furthermore, the most common complaint about this type of mask is that they typically become very hot and uncomfortable within a short period of time, thus resulting in the wearer’s tendency to remove/ adjust them frequently. This act of “handling the mask” dramatically increases the potential for contamination as the mask surface can easily contaminate the wearer’s hands which can then be transmitted to other parts of the body. The cost of these respirator masks can be three to six times more than the paper, surgical mask. This is still affordable in small amounts. However, when the time comes that we need breathing protection several times a day, for months on end, this type of mask will become very expensive indeed. There aren’t many washable, cloth masks on the market, but it’s within this small group of masks that I believe I found the best overall masks out there. The best washable, cloth mask I found was the Breathe Healthy® mask (www.breathehealthy.com). Breathe Healthy, based in Williamsburg, Virginia, have been selling these multi-layer, high-tech masks since 2006 and there are some very compelling reasons that make it a great choice. The cloth mask itself is not high-tech, but what goes into it is. The Breathe Healthy masks are treated with Dow Corning’s AEGIS Microbe Shield, which underwent years of research and development and dozens of studies verifying the safety and performance of this technology. In a nutshell, what makes the AEGIS Microbe Shield so unique is its chemical technology that can be applied to material making it anti-microbially active. The AEGIS Microbe Shield permanently bonds with the fabric and will not leach or diminish overtime. The technology relies on the coating on the fabric remaining affixed and killing microorganisms as they contact the treated surface. I found it very compelling that American Hospital Supply Corporation, outside university laboratories, private laboratories, and Dow Corning contributed over 30 studies verifying the safety and performance of this technology in medical use. However, these masks do not carry the CDC’s N95 rating, because they are still fairly new to the market. Not only are the mask’s protection qualities unique, they also offer a washable and environmentally friendly alternative to the wasteful, one-use-only, hospital paper masks. The durable Breathe Healthy masks, when cared for properly, can last as long as your favorite t-shirt. This is a great value and makes good financial sense over the paper masks. You could spend a hundred dollars on paper masks in one year, or you could buy one Breathe Healthy mask for $14, which can last you for multiple years. I also like these masks because they come in child sizes. This is a big deal since the vast majority of mask manufacturers don’t give any consideration to making masks for little faces. Our children are very vulnerable to germs and sickness, especially while in school. These can be highly contagious environments and it means a lot to have access to a brand that can help protect them. These masks also very soft and comfortable and come in a variety of colors and designs, which is great. The comfort of these masks is a huge benefit when there is a need to keep your mask on for long periods of time. I mean, if we need to possibly incorporate the wearing of these masks into our daily lives, then I want one that looks good, is comfortable to wear and does a great job protecting me. And let’s face it, there seems to be a visual correlation in our minds between those white hospital masks and sickness. Those hospital masks just make you look sick. When shopping for a mask, be aware that no manufacturer should claim that their partial facemask will fully protect you from the Swine Flu, Bird Flu or other airborne contaminants. There are simply too many variables including face shape, facial hair, movement, talking, adjusting, fit, flu mutation, viral size, viral form of transmission, etc. Obviously this does not apply to “fitted masks,” full face respirators, or medical devices worn by First Responders/Hazmat personnel. Equally important to mask consideration is infection that can occur from germs on your hands when touching your lips, inner nose or the corners of your eyes. It is important to stress that any partial face mask manufacturer would be remiss in claiming that wearing their masks will provide total protection from the Swine Flu virus or any other undetermined flu mutations that may occur. Don’t forget, all partial face masks should be considered a “First Line of Defense” and not an assured means of protection. However, since Swine Flu has achieved pandemic levels, once it appears in your community again, wearing a mask… any mask … is recommended over not wearing one at all. The CDC states that one of the primary means of flu contamination occurs from droplets that are generated when infected persons cough or sneeze. One of the primary purposes of any mask is to defend against airborne effluents, and all types of masks offer various degrees of effectiveness. The reality is, when the Flu hits our communities again, or a natural disaster strikes, for us to maintain a normal life and visit grocery stores, schools, shopping malls and airports – places with crowds of people – we will need to incorporate frequent hand washing and breathing masks into our everyday lives. Shop around and find the best type of mask for you and your family and get them now before everyone else tries to. It’s always better to have and not need, than need and not have. Williamsburg, Virginia, January 15, 2010 – Breathe Healthy® masks, treated with Dow Corning’s cutting-edge AEGIS Microbe Shield, offer high-performance, comfortable and fashionable protection against Flu, viruses and allergies. Breathe Healthy®, based in Williamsburg, has been selling these multi-layer, high-tech masks since 2006. The cloth masks are treated with Dow Corning’s AEGIS Microbe Shield, which underwent years of research and development and dozens of studies verifying the safety and performance of this technology. Not only are the mask’s high-performance protection unique, they also offer a washable and environmentally friendly alternative to the wasteful, one-use-only, hospital paper masks. The durable Breathe Healthy masks, when cared for properly, can last as long as your favorite t-shirt. What makes the AEGIS Microbe Shield so unique is its chemical technology that can be applied to material making it anti-microbially active. The AEGIS Microbe Shield technology permanently bonds with the fabric and will not leach or diminish overtime. The technology relies on the coating on the fabric remaining affixed and killing microorganisms as they contact the treated surface. When applied to fabric the AEGIS anti-microbial forms a colorless, odorless, positively charged, polymer coating which chemically bonds, virtually irremovable, to the treated surface. You could think of it as a layer of electrically charged swords. When a micro-organism comes in contact with the treated surface, the sword punctures the cell membrane and the electrical charge shocks the cell. Since nothing is transferred to the now dead cell, the Antimicrobial doesn’t lose strength the sword is ready for the next cell to contact it. Other anti-microbials on the market are designed to kill germs quickly but then dissipate quickly too, because they can be toxic to people. The AEGIS Microbe Shield takes a totally unique approach. It provides an effective initial microbial kill when applied, like the conventional methods, but it also provides long-term control of growth on treated surfaces for the life of that surface. The surface itself is modified to make it anti-microbially active. “We decided to use the AEGIS Microbe Shield with our masks because we found it to be the most effective and long lasting, anti-microbial treatment available,” said Vahey, who has seen his sales increase in the last year due to increased public awareness of Swine Flu and pandemics. Years of research by Burlington Industries, outside laboratories and Dow Corning verified the safety and utility of this technology. At the time, American Hospital Supply Corporation (now part of Baxter International) was reviewing the use of anti-microbials on medical, non-woven products. The stringent rules governing the use of any particulates or chemicals that could enter the body via a wound, etc. made this review protocol very severe. This research eliminated all other anti-microbials except what is known today as the ÆGIS Anti-microbial. American Hospital Supply Corporation, outside university laboratories, private laboratories, and Dow Corning contributed over 30 studies verifying the safety and performance of this technology in medical use. After its release, Dow Corning immediately started research and development programs, and again after testing and reviewing all available anti-microbials, their technical assessment was unquestionable in its verification of the utility of the ÆGIS Anti-microbial over any other technology available. Williamsburg, Virginia – November 5, 2009 – Breathe Healthy manufactures and sells germ-fighting masks that can be used anywhere from doctor’s offices and schools, to your own backyard. Although there are other masks on the market, Breathe Healthy differentiates itself by offering products that are designed for comfort and have a permanent antibacterial treatment. Because they are washable and re-usable, they are also more ecological. Since the recent pandemic spread of H1N1 viruses plaguing school districts, health centers and the general public, Breathe Healthy has noticed a considerable increase in web hits, inquiries and sales. In an effort to better serve visitors, Breathe Healthy, with the help of Woodpile Studios (www.woodpilestudios.com) and its associates, launched a new website. This new site is easy-to-use and contains an abundance of information and product selection. Breathe Healthy President, Michael Vahey, noted that “customers are concerned and feeling a sense of urgency with the scarce availability of flu vaccines and the proliferation of serious cases cropping up daily. People are going to any measure to protect themselves and their family.” While Breathe Healthy offers products to help with allergies, asthma and general respiratory protection, many recent customers are interested in them for safeguarding loved ones this flu season. Breathe Healthy was purchased in 2009 with a vision to grow the company, and invest resources to appropriately market the core product offerings. Learn more about Breathe Healthy masks at www.breathehealthy.com.